Art can be a powerful tool. Hymns and songs have long been teachers of sound doctrine. Movies can teach and explain doctrine. Even visual art – paintings and sculptures – can serve a purpose. However, if all of these were to be removed, the Gospel would not be stopped in its place. This post implies otherwise, elevating man’s art and showing a low view of the Gospel. The Gospel does not require the help of human art. If an atheist experiences this schitzophrenia that Keller speaks of, he isn’t instantly driven to God. He will continue in his sins. Only the Gospel has the power to save. He claims we are never going to reach the world with great Christian art, and yet the Bible never commands Christians to make great art and show it to all people, but instead to preach the Gospel. While Keller arrogantly raises human art up, he also blasphemes the Gospel as insufficient without the aid of human artwork. It is concerning that such a prominent figure would make such claims, but not surprising. Keller is one of the leading figures in the Social Gospel movement among New Calvinists. He has even made claims such as, “Jesus’ life, death and resurrection was an infinitely costly rescue operation to restore justice to the oppressed and marginalized.” (Reason for God, p. 224). 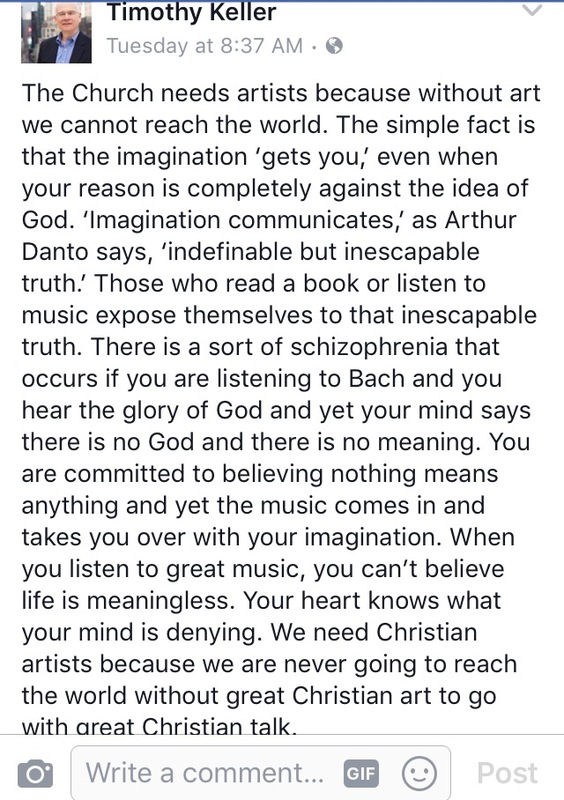 So it is to no shock that someone who accepts such a trite, worldly gospel has such a low view of it that they claim it cannot reach people without the aid of art. If I were to adhere to the Social Gospel, I might think the same thing. Ultimately, in Keller’s attempts to defend the display, he dug himself a deeper hole and made claims that are much worse than what was shown on that stage. It reveals how little he trusts in the power of God to advance the Gospel without humanity making it more appealing and palatable through the use of art. The Gospel is the power of God for salvation, not anything else.